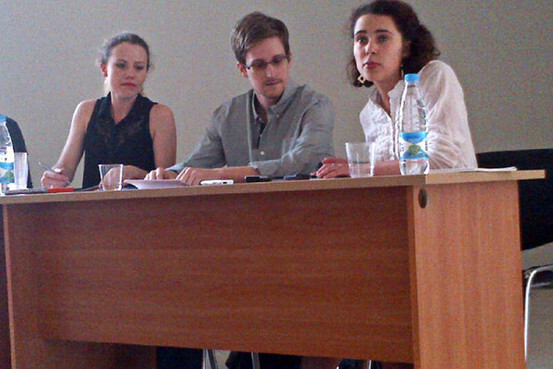 Whistleblower Edward Snowden made a public appearance yesterday at a Moscow airport, beside a staff member of the Wikileaks organization, met with representatives of a half-dozen or so human rights groups. Snowden has not been seen in public and was stuck in the transit area of Moscow’s Sheremetyevo Airport since arriving there on June 23 from Hong Kong. A 30 second video posted on youtube, which did not name the source for this clip. Notable because no press were permitted inside, and no video was allowed. Snowden said that he wants asylum in Russia before moving on to Latin America and assailing U.S. surveillance programs as illegal and immoral, but Immigration officials in Russia say they've not received any application from Edward Snowden. As Snowden explained it Friday, he disputes the notion that his actions are doing damage to the United States. As a result, Putin's condition doesn't apply. Snowden said that he has received offers of asylum and support from Venezuela, Ecuador, Bolivia, and Nicaragua and thanked those countries for their assistance. The problem Snowden, explained, is that he faces travel restrictions in reaching those countries and fears he will be apprehended en route. A Venezuelan government minister on Wednesday urged citizens to shut Facebook accounts to avoid being unwitting informants for the U.S. Central Intelligence Agency, referring to recent revelations about U.S. surveillance programs. Meanwhile, Microsoft denied it gave US security agencies “direct access” to SkyDrive, Outlook.com, Skype or any of its products. Microsoft stressed that it only provided customer data in response to lawful government requests.